To welcome the coming of the “Year of Dog”, starting from 4th February to 4th March, 2018, Harbour City will be set up in festive Chinese New Year decorations. 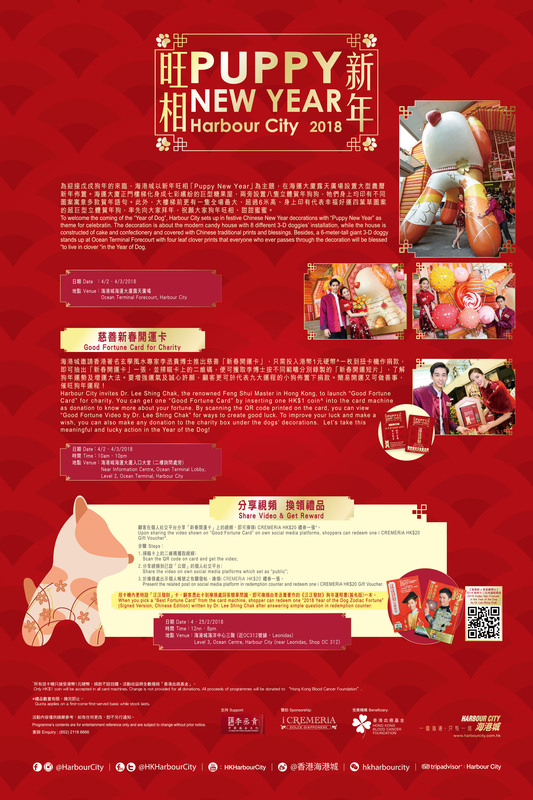 The main theme of this year is “Puppy New Year” to celebrate the Year of Dog. The decoration is about the modern candy house with 8 different 3-D doggies’ installation, while the house is constructed of cake and confectionery and covered with Chinese traditional prints and blessings. For example, Lucky Bam which represents wealth and prosperity and Peace Knot which represents health and happiness. Besides, the Ocean Terminal Forecourt of Harbour City will be set up with a 6-meter-tall giant 3-D doggy, with four leaf clover prints that everyone who ever passes through the decoration will be blessed “to live in clover “in the Year of Dog. Harbour City invites Dr. Lee Shing Chak, the reowned Feng Shui Master in Hong Kong, to launch “Good Fortune Card” for charity. Want to find out what your fortune is in nine categories including family, health, wealth, career, study, love, fortune, beauty & happiness? You can get one “Good Fortune Card” by inserting one HK$1 coin^ into the card machine as donations to know more about your fortune. By scanning the QR code printed on the card, you can view “Good Fortune Video by Dr. Lee Shing Chak” for ways to create good luck. To improve your luck and make a wish, you can also make donation to the charity box under the dogs’ decorations. Besides, upon sharing the video shown on “Good Fortune Card” on your own public social media platforms, shoppers can redeem one iCREMERiA HK$20 Gift Voucher* each. Let’s take this meaningful and lucky action in the Year of the Dog. When you pick a “Best Fortune Card” from the card machine, shoppers can redeem one “2018 Year of the Dog Zodiac Fortune” (Signed Version, Chinese Edition) written by Dr. Lee Shing Chak. ^Only HK$1 coin will be accepted in all card machines. Change is not provided for all donations. All proceeds of programmes will be donated to “Hong Kong Blood Cancer Foundation”. *Quota applies on a first-come-first-served basis while stock lasts.